Candles and posters are seen at a Sunday night vigil dedicated to a 2-year-old girl found dead in a Fontana home on Monday, Oct. 24 ,2016. FONTANA, Calif. (KABC) -- Loved ones gathered at a vigil Sunday night in Fontana to honor the memory of a 2-year-old girl found dead in her home last week. 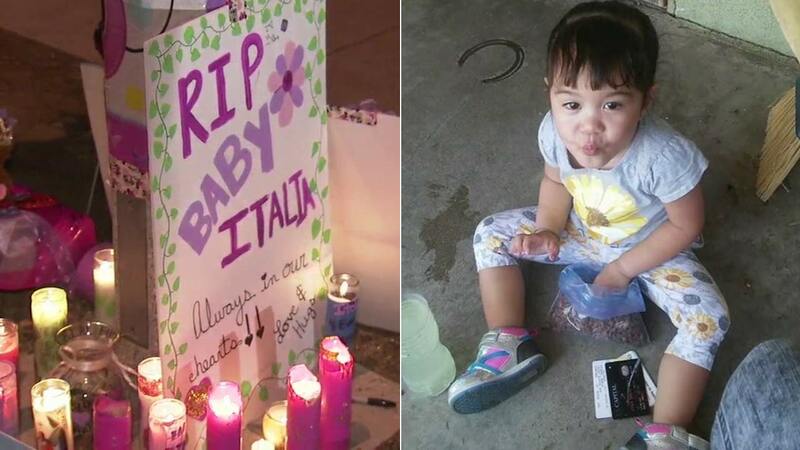 Friends and family have been leaving flowers and candles at a memorial for the little girl they called "Italia." The child was found dead inside her playpen at a home on Slover Avenue last Monday. Fontana police say they found significant evidence of neglect and abuse against the child which they believe contributed to her death. "But just to see strangers, absolute strangers, there's a lot of them that we met for the first time tonight, just to come and give their blessing or support however, and it was just really, really heartwarming and heartfelt," said the girl's grandmother, Crystal Cobb. Authorities arrested the girl's mother, 20 year-old Cheyenne Cobb, and the girl's step-grandfather, 47-year-old Jon Palechek, on suspicion of felony child abuse. The investigation was ongoing. Anyone with more information was urged to call the Fontana Police Department at (909) 350-7740. Cheyenne Cobb, 20, (left) and her stepfather Jon Palechek, 47, (left) are shown in mugshots.